As a consumer, it can be difficult to have it all. Many of our favorite products often come at the cost of the ecosystems, economies, or people from which they are sourced. 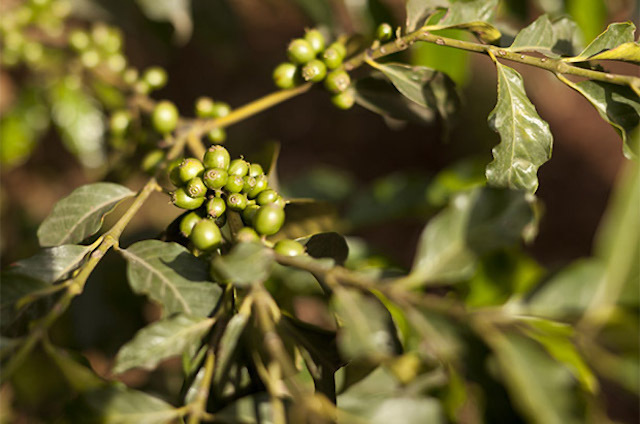 But in Ethiopia, TechnoServe and Nespresso are working to build a coffee value chain that helps the nation’s farmers and markets to thrive, while protecting their indigenous biodiversity and improving their resilience to climate change. Here are four ways the partnership is benefiting people, profits, and planet. By providing training on the benefits of shade and making indigenous trees available to farmers at nearby cooperatives, the AAA Sustainable Quality program is increasing local biodiversity. Shade is important for Arabica coffee, which evolved in the dense forests of western Ethiopia. Too little shade, and high temperatures reduce moisture levels within the soil and the trees themselves. Too much, and the lack of light lowers yields. 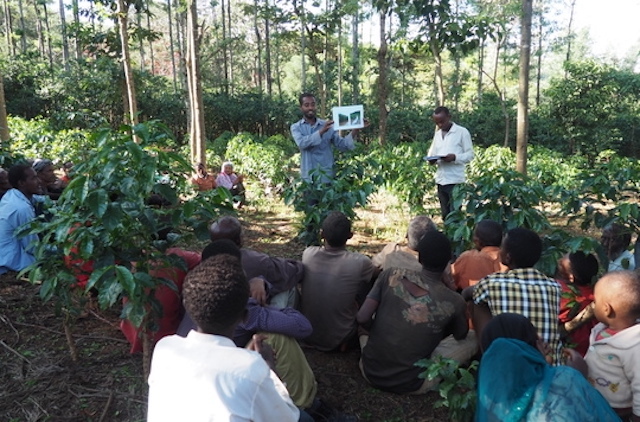 Through the AAA Academy, TechnoServe teams teach farmers in the Sidama zone – who previously maintained little tree cover for their coffee crops – to maintain shade levels between 20 and 40 percent. By providing training on the benefits of shade and making indigenous trees available to farmers at nearby cooperatives, the program is increasing local biodiversity. Vetiver grass wetlands, among other techniques, help wet mills to process high-quality coffee without polluting local streams. Centralized wet mills are an essential link in Ethiopia’s coffee value chain. By supporting wet mills to improve the quality of their processing operations, TechnoServe is helping farmers to tap into premium markets and make the most from their crop. But processing can be messy, spilling wastewater heavy with coffee pulp into nearby streams and polluting the water for local communities and ecosystems. By working with TechnoServe staff to implement simple technological and ecological solutions, 215 partner wet mills in Ethiopia and Kenya are receiving training to reduce and track their water use, while developing tailored solutions to dispose of their waste water. 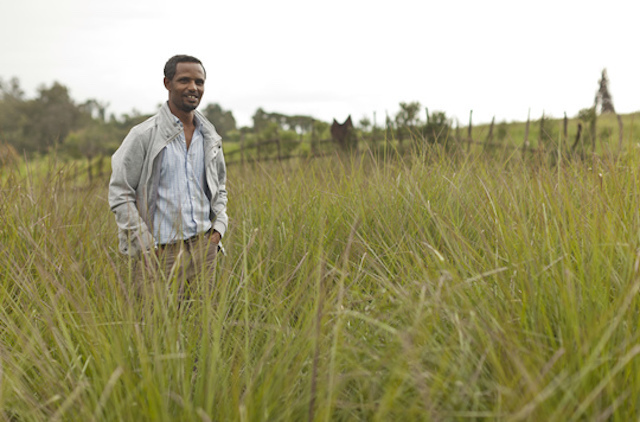 Whether employing new machinery, ecosystem services such as vetiver grasslands, or other methods, mills are improving their processes to be an economic benefit to the communities they operate in, rather than an environmental hazard. Some mills even collect the pulp that used to wash downstream, composting it and making it available for farmers to use on their coffee plots. 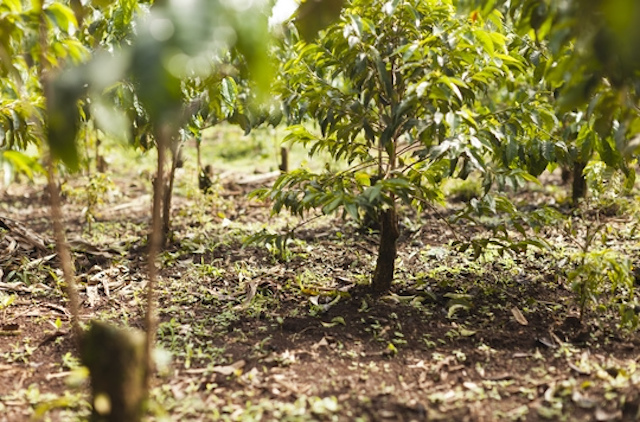 Farmers in the AAA Academy training program are implementing business and environmentally savvy solutions to keep their soil and coffee plants rich in nutrients and safe from erosion. Soils in Ethiopia are known as the best coffee-growing soils in East Africa. Although some key nutrients do need to be returned to the soil after harvest, most Ethiopian farmers are able to grow their coffee organically. TechnoServe trains farmers in best composting practices, helping them to access pulp compost from nearby wet mills, or to make their own on the farm. Whether home-made or from the mill, the compost is free and easy to make, meaning this nutrient-rich, organic input makes economic sense for a sustainable coffee sector. In addition, other AAA Academy trainings – on topics such as planting shade trees, mulching, or intercropping with beans during stumping periods – can help to capture and lock additional nutrients into the soil, and fight erosion due to the support provided by extra root systems and ground cover. Banke Elias (left) and her AAA Agronomist. After stumping her trees, Elias's yields and income have increased, allowing her to pay her triplets' school fees. Even with all the right systems, techniques, and training in place, environmentally sustainable coffee is only feasible when it also provides sustainable livelihoods for the farmers and workers who depend on it. TechnoServe staff teach farmers record-keeping skills that not only help in general business management, but also show how the techniques they’ve learned through the program make environmental as well as business sense. Banke Elias, a coffee farmer from the Sidama B area, stumped 500 of her 2,000 coffee trees in 2015 after attending AAA training. The practice – which involves cutting a coffee bush down to a sheared trunk to encourage new, more productive branches to sprout – is not easy for farmers who rely on maximum coffee harvest to support their families. Adding expensive (and environmentally harmful) inputs, such as pesticides or fertilizers, could feel like a less risky way to increase their production. But Banke’s AAA Agronomist – one of the growing number of female agronomists working through the program – assured her that this was the most cost-effective way to boost her harvest, and in 2017 Banke's stumped trees yielded more than 3 kilograms of cherry each, compared to only 1 kilogram the year before. With the $1,000 in increased income from this successful harvest, Banke paid her triplets' school fees and installed a cement floor in her home. Farmers like Banke will continue to receive visits from AAA Agronomists as they implement the techniques they’ve learned to the next two crop cycles. During each project cohort, TechnoServe also trains local government extension agents in the AAA Academy curriculum, ensuring that they will continue to teach these best practices and spread the impact of better coffee harvests long after the program’s end. To date, TechnoServe has trained more than 47,000 farmers – nearly 40 percent of whom are women – in best agricultural practices through the AAA Academy. Read more about TechnoServe’s work to build prosperous coffee economies and ecosystems.